Strawberry crops are ready each year at the end of June or beginning of July, for about two to four weeks each summer. The farm offers both u-pick as well as custom picked [pre-picked] berries. It is an enjoyable place for the entire family, children included! It has taken 18 years to build up the business to what it is today! From one beehive in 1999 to 1,700 beehives and 20 acres of strawberries today. Andy has always enjoyed working with soil. So in 2004, Andy planted his first acre of strawberries. It all started when Andy Loewen’s father decided to sell his dairy cows. He loved farming, but with the cows being sold he had to do something else. He bought a beehive in 1999. The next year 50 hives were purchased this then expanded to the 1,700 honey bee colonies that are being managed today. Andy’s twin sister was his first “employee partner”. 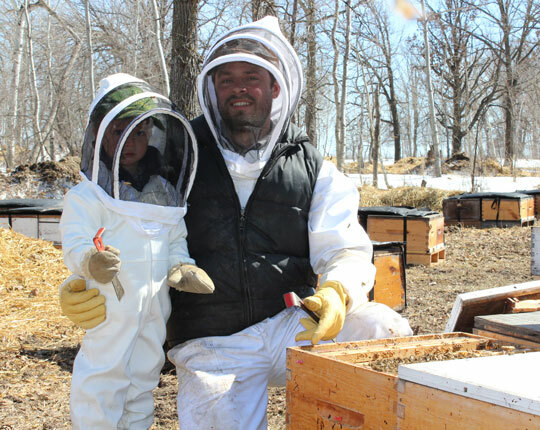 Together they managed up to 500 bee hives. 2008 was a very special year with an abundant strawberry crop – Andy hired more summer students to help harvest the crop, and amongst that group of students he found his bride Angelina who in January of 2010 become his life-time partner. Andy’s siblings were also starting to help with the honey bees and strawberries. When Andy and Angelina met this brought more summer help to the busy farm by her hard working younger siblings. Now, together with their growing family Joel Isaiah (6), Angelina Judith (4), Andrew Josiah (2) and Jeremiah Harold (4 months) are striving to produce quality and healthy food for the surrounding communities, which God has made for all of us to enjoy.